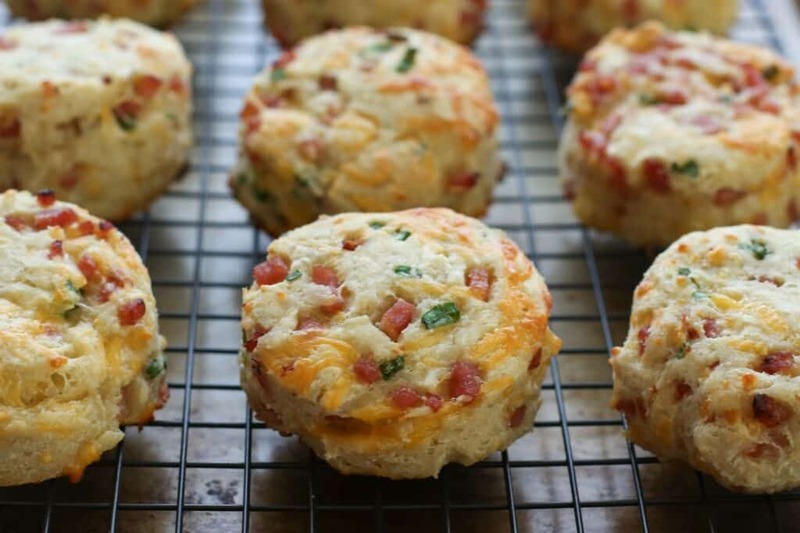 Savory ham and cheddar cheese are layered into these fluffy biscuits. Served with a plate of scrambled eggs or alongside a bowl of soup, these biscuits disappear almost as quickly as I can make them. We are huge fans of “leftover” recipes. Anytime I can cook a meal and then use the leftovers in another meal, that makes my day. Ham is one of my favorites for making multiple meals. I started last week by making our favorite Balsamic and Dijon Glazed Ham. Then I made Old Fashioned Ham Balls and an amazing Stir Fry. Next on my list was a Cheesy Potato, Ham, and Egg Breakfast Casserole. 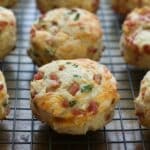 These Ham and Cheese Biscuits were actually the first recipe I made with the leftover ham and they turned out so well, I made them again the very next day because my boys begged for more of them. I stashed a handful of the biscuits in the freezer and I’ve been eating them split in half, stacked with an egg in the middle, for my breakfast the past few days. I also served the biscuits with a bowl of Spicy Five Bean Chili. My whole crew voted these biscuits a huge success. For more carb-loving deliciousness, I’ll be trying this Red Lobster copycat recipe for Easy Cheddar Bay Biscuits. (I can never get enough of the cheesy bread combination!) This Slow-Cooker Sweet Corn Bread is also on my list to try soon. I love having homemade breads tucked into the freezer, so this Blueberry Coconut Banana Bread is on my meal plan for the week as well. Kitchen Tip: I use these biscuit cutters and this baking sheet to make this recipe. Whisk the egg into the milk and then pour into the dry ingredients in the mixing bowl. Stir just long enough to combine. The mixture should be somewhat dry and just a tiny bit sticky at this point. Add the ham, cheese and onions and stir or press lightly with your hands to combine. Sprinkle a tablespoon of flour onto a countertop or a pastry mat. (See COOK'S NOTE above.) Dump the dough out onto this surface and sprinkle a half tablespoon or so of flour across the top of the dough. Lightly press the dough with your hands to flatten it until it is about 1" thickness. Add just a sprinkling more flour as needed, to make sure the dough isn't too sticky. Use a biscuit cutter, round cookie cutter or drinking glass to cut the biscuit shapes out of the dough. You can also shape them with your hands, if that is more your style. Place the cut biscuits on a parchment or silpat lined baking sheet. Press the remaining bits of dough into a biscuit shape with your hands. Bake for 16-18 minutes, until the bottom of the biscuits are lightly browned. The tops of these biscuits will not brown very much at all, although the pieces of cheese in the dough should toast nicely. Remove from the oven and transfer to a basket or cooling rack. Enjoy! I almost always roll out my biscuits on an old fashioned tea towel, the same way my mother and grandmother did it. I sprinkle the towel with a couple tablespoons of flour and then dump the biscuit dough from the bowl into the center of the towel. Lift the sides of the towel and press into the dough with the lightly floured towel. Press lightly to combine the dough (and the fillings) without actually "kneading" the dough too much. Pat the dough into a flat round shape and cut into biscuits. FREEZER MEAL: When the biscuits are completely cool, transfer them to a freezer safe Ziploc bag and remove as much air as possible. Freeze until ready to eat. Reheat in the microwave or thaw at room temperature. Disclosure: I’ve partnered with Smithfield to share this recipe with you. Thank you for supporting the brands that make Barefeet In The Kitchen possible. As always, all thoughts are my own. Hi, just wondering--can you refrigerate the dough overnight if you plan to make the biscuits in the morning? I haven't tried that, but I can't think of any reason why it wouldn't work fine. If you do try it, let me know how the biscuits turn out! I made these last nite. They are easy awesome and almost all gone! LOL thank you for sharing the recipe. Thanks for the recipe. Made these and have frozen them for a quick breakfast later when I'm too lazy to cook! Oh my goodness! I made these a couple of weeks ago and I can honestly say they didn't last all week. They are so good, even my mother who doesn't like 'biscuits' loved them and is still talking about them! I'm gluten free. Why so many different types of flour? Could I just use the standard gluten free flour? This is simply the combination that I found worked best. Feel free to adapt the recipe using approximately 2 1/2 cups of your favorite GF flour blend. Let me know how it works for you! Wow, these look amaaazing!!! 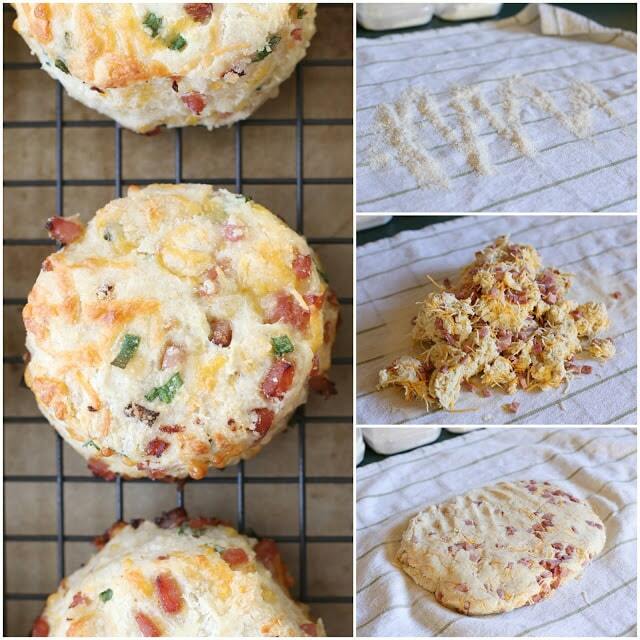 I have a ham in the oven right now, so I will definitely be trying these for hubby's bday breakfast in the morning!! We have been making a batch of these biscuits every weekend for months now. 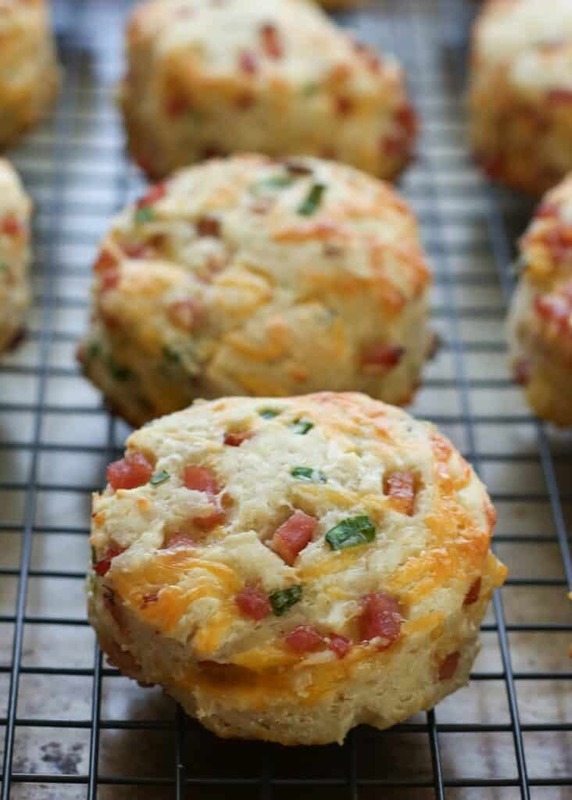 I keep them in the freezer and warm them up in the mornings for super easy breakfasts. We LOVE them!!! Definitely making these! I think we'll have some at breakfast AND I'll freeze some for the kids' lunches. Fascinated by the tea towel trick. These are really good. I made and froze them. Took on a family trip to the beach, popped them in the oven to warm. Served with scrambles eggs. Everyone loved them, especially my 7 and 10 year old grandsons. Thanks for putting the total amount of flour for us regular people without gluten issues. Can you use regular white flower? If you are not in need of a gluten free recipe, you can substitute a total of 2 1/2 cups all purpose flour (white flour) for the items marked with an *. I hope that helps! I made it with Arrowhead Mills Gluten Free Hertiage blend and it worked well. I also brushed the tops with milk and they browned up nicely. Thanks. I am not sure if this already posted, but was wondering if a large egg would suffice, or if I need to add something else to make up the difference? Thank you"
Yes, a large egg will work fine. If it seems too dry, you could add a tablespoon of milk, but I don't think you'll need to do that. This GF biscuit recipe is the best. We have been enjoying them for a couple of years now. They freeze well and make an easy lunch with soup or a breakfast sandwich. I use your tip for using a tea towel to roll biscuits out and it works great. Makes clean up really easy. Thanks for a great Recipe!